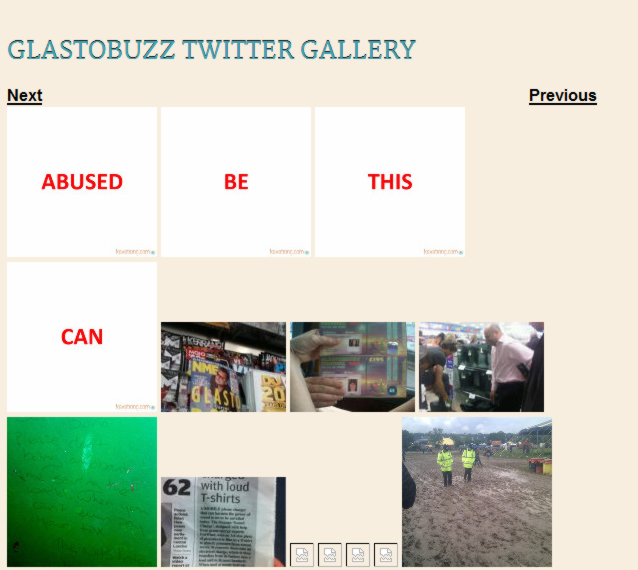 With the ability to share our pictures to the internet in an instant via Twitter, Facebook etc through services such as Flickr, YFrog and Twitpic, it’s of no surprise that people are sharing their experiences of live music and events. With the start of summer solstice came the Glastonbury festival. To most people who attend Glastonbury that means mud, music and more mud. Naturally people want to share their experiences online and a service called GlastoBuzz was set up to allow people attending Glastonbury to be able to do just this – Only they decided to do it through an unmoderated API call. This shows the dangers of unmoderated feeds where the public have the ability to input messages directly. GlastoBuzz should probably fix this quickly.